Blast off alongside space expert Sarah Cruddas on a journey through space exploration history, from the Apollo Moon landings to mind-boggling plans for living on Mars. How did we land on the Moon? What will the space jobs of the future look like? And why did we send a car to space? The Space Race answers all of the big questions that kids have about space travel. 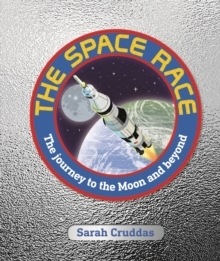 Sarah Cruddas brings to life the hidden stories behind the most famous space missions, before taking the reader on a journey through our space future. This children's book includes a foreword by NASA astronaut Eileen Collins, the first woman to command a Space Shuttle mission. It also includes fascinating insights from Sarah's interviews with real-life astronauts including Apollo 17's Eugene Cernan and Virgin Galactic Test Pilot Kelly Latimer. Space-mad kids will delight in the detail, photographs and information on each page, and will love seeing intricate diagrams of iconic spaceships, Moon cars and space suits created by artist Mark Ruffle. Propelled by recent scientific discoveries and printed to coincide with the 50th anniversary of the Apollo 11 Moon landing, The Space Race is an essential children's handbook to understanding every aspect of the history, and future, of human space travel.